A good friend of mine sent me the first three seasons of Downton Abbey, and as a result I have become obsessed with all things tea. Including the little cakes and such that go on the side. I modified a recipe from my vintage Virginia Hospitality cookbook to create a little jam teacake. The original recipe involved pecans instead of jam, and I'm just not a huge fan of pecans. Mix cream cheese and butter. Stir in flour. Chill 1 hour. 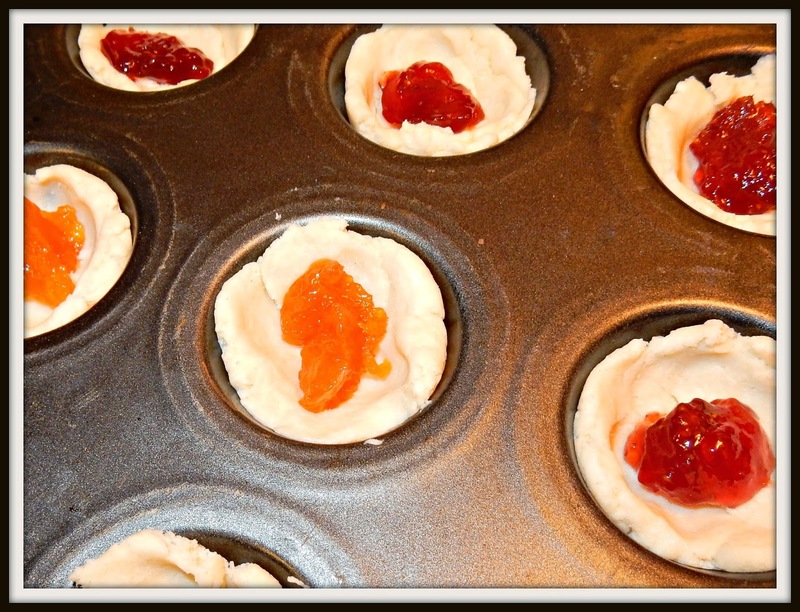 Shape into 2 dozen 1 inch balls; place in tiny ungreased 1 3/4 inch muffin tins. Press dough on bottom and sides of cups. Preheat oven to 325*. 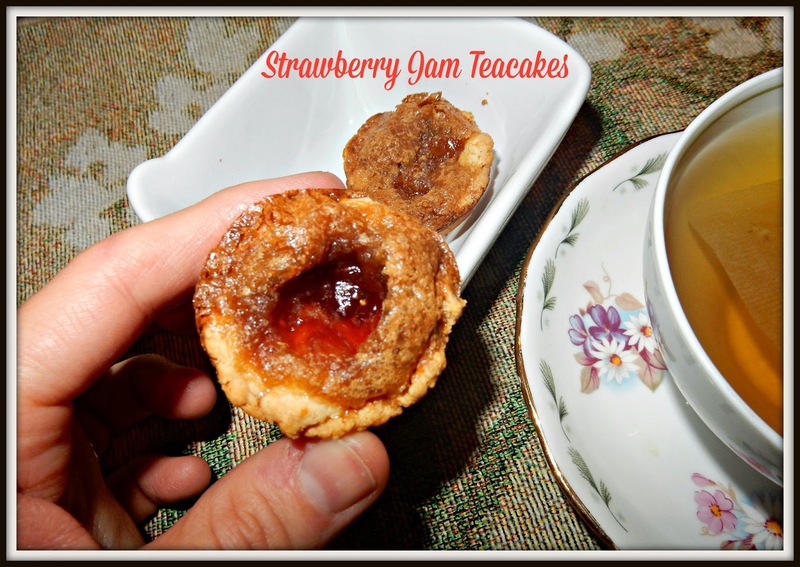 Put a teaspoon of preferred flavor of jam in each cup. Beat together egg, sugar, butter and vanilla until smooth. Drizzle egg mixture over each cup. Bake 25 minutes or until filling sets. Cool before removing from pan. Readers - these are going to just melt in your mouth! Do you drink tea? Do you have a preferred flavor? Yum, yum, yum! I'd eat those cakes with any beverage! :-) I do like hot tea. There's an English breakfast tea I like and a Tazo green tea that's good. I find it interesting how the experience of a coffee break is so different from a sharing of tea. i like hot green tea in the evenings in the winter. sometimes i do a cup of rooibos - not sure if i spelled that right. Those Tea Cakes look wonderful! If and when I drink tea, which isn't often, I like the Peppermint flavored. Very cute and I'm sure they taste delicious. Over here, "Afternoon Tea" is a tradition. It's where mini pastries and crustless sandwiches (cut in triangles) are served on tiered platters along with tea. Most large hotels offer this and it is a fun thing for a group of girlfriends to do. I do love my teas, mostly herbal teas, and have a special blend I put together myself. Bet you would love a cream tea! The tea cakes look yummy for sure. I havent watched Downton Abby, but I do like tea...any flavor really. Downton Abbey is our favorite show!!! These are adorable! Now, what will the boys drink with them? Do they like hot or iced tea? We love both, plus all kinds of coffees and we have a cabinet shelf full of teas and coffee. We love Constant Comment, mints, and chai. If you have never tried Constant Comment, buy a box. It comes in decaf too. I bet you would like it. I'm a big tea drinker too, although coffee comes first on the list! We like that show too! Not sure if my comment went through! We like the show too, and I'm a big fan of tea, although coffee is first on the list! Used to drink it with cream and sugar, I like Earl Grey I will have a cup if you have more of these around.A little sis had High Teas where you went through a particular protocol with fixing and serving teas. I have a lot of tea pots I collected. I have never watched Downton Abbey but have lots of addicted friends. Best ever is a royal English breakfast black tea latte from Starbucks made with whole milk and NO syrup. And I make them take the tea bag out before they give it to me. If they leave it in there, it oversteeps and the tea is bitter. those look easy to make and look delish!! thanks for the recipe...love downton abbey!! Addicted follower of Downton Abbey, and a tea drinker - all because I was born and raised in England I guess!! Favorite tea - and I only drink hot tea despite living here in the south for over 30 years - is Empress Grey and Earl Grey. I will have to try this recipe, they look delightful and delish! Never had this kind of teacake before, tempting to try!!! Looks so yummy! I want to try it! For reasons I can't define, I really like that show. I've watched every episode. When I lived in Europe, I spent some time in England. I was always bemused by the great effort they put into tea, and all the little cakes and sweets. I never learned to like tea, though. Still a coffee drinker. Those look really fun. I'm always looking for things my husband and daughter can bake at daddy school! These sound (and look) delicious. I am wondering if I can change this recipe up for my husband's low carb diet. I think I can do almond flour for the crust, but will have to study on what to use in place of jam. I love Downton Abbey. I was hooked after the very first show. I drink green tea, white tea and oolong tea. I should drink more, I've been slacking. I have coffee every morning. One of the reasons I drink tea is so that I don't eat sweets but I have to admit - that would be a real treat. I love all decaf teas, especially from Republic of Tea. But my all time favorite is my homegrown peppermint tea. SO good! Yummy! I think this looks like a fun baking activity to do with Livie. I need to make these and have tea. Tomorrow!